IC 2177 is an HII complex lying on the border of Monoceros and Canis Major. Covering over 3 degrees of sky, this beautiful nebula lies in one of the farthest arms of our Milky Way galaxy and is about 100 light years across. 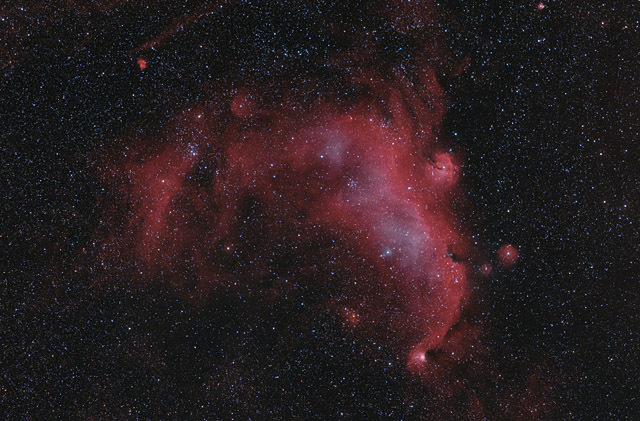 The designation IC 2177 refers to the nebulosity spread across the wings of the Seagull. The head of the Seagull is Vdb 93, while the bright HII region at the bottom wing is Cedarblad 90. Also contained within the nebula are several open clusters - NGC 2343, NGC 2335, Collinder 465, and Collinder 466. Software Used Images Plus 5.75 for camera control, calibration, stacking, digital development, feature mask, smoothing and noise reduction, and multiresolution sharpening. Photoshop CS5 used for levels and curves, high pass filter, screen mask invert, selective color, HaOIIIRGB combining, and unsharp mask. Gradient Xterminator for gradient removal. Focus Magic for focus restoration. Registar for stack alignment and registration. Notes This is my first light image with my new monochrome Canon 450D. I used the monochrome camera for capturing the narrowband Ha and OIII. I captured the RGB (color) and some of the Ha with the color camera. I'm very happy with the final result - the image has some nice color, the stars are very tight, and the Ha provides some good detail.